Visitors to D.C. often include Arlington National Cemetery on their sightseeing itinerary. With the graves of two presidents, famous military figures, and the awe-inspiring Tomb of the Unknown Soldier, it deserves the more than 3 million people who visit each year. Arlington is not the only national cemetery in the D.C. area, though. About 6 miles south of Arlington National Cemetery is Alexandria National Cemetery. 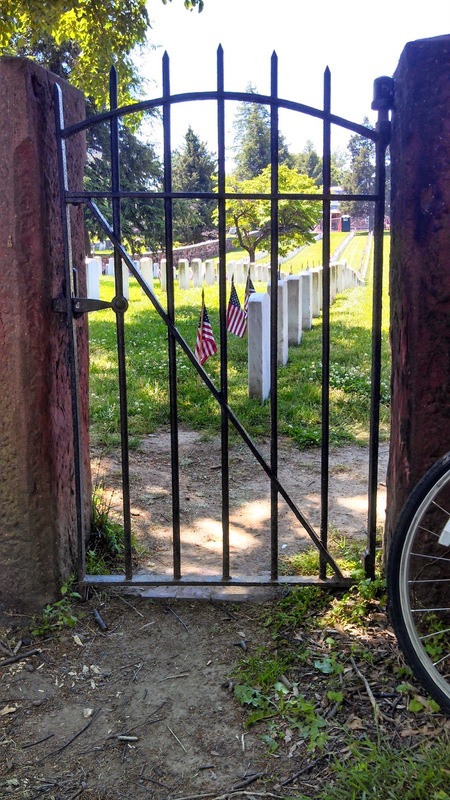 The Alexandria cemetery predates Arlington's cemetery and originally served as the burial place of Union soldiers during the Civil War, many of whom were stationed in Alexandria or died in Alexandria's hospitals. Servicemembers from subsequent wars have since been buried in the cemetery, but it is now closed to new internments. With little more than 5 acres, it is much smaller than Arlington National Cemetery, but the intimate grounds are just as powerful. My family and I visited on Memorial Day. The cemetery's main entrance is on Wilkes Street, but we parked on Jamieson Avenue on the north side of the cemetery. A stone wall surrounds the cemetery, but a small gate on Jamieson Avenue allows easy access for visitors who walk from Old Town. The grounds are set on lightly rolling hills with large trees interspersed throughout and an American flag flying above the center of the cemetery. 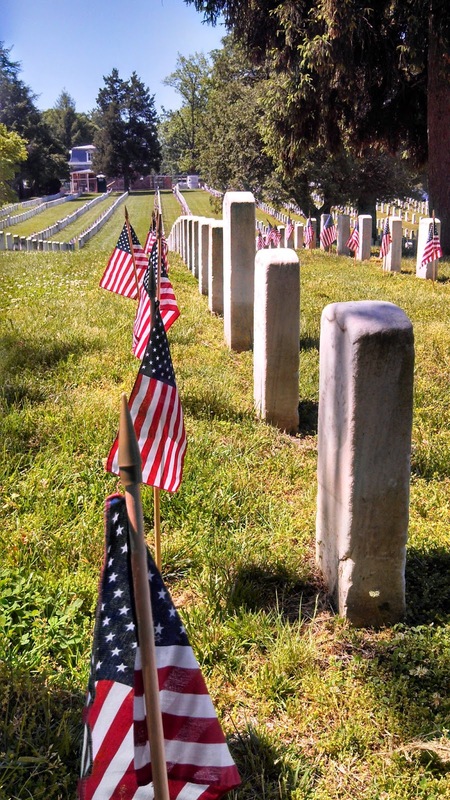 Most of the headstones are military-issued markers from the Civil War era, and each was adorned with a small American flag for Memorial Day. Unlike Arlington, no giant markers distinguish well-known officers. The simplicity of the headstones serves as a reminder that not one of these lives was worth more than the others. Even the one monument on the grounds is modest in its size, a small granite stone with a plaque honoring the four civilians who died pursuing Abraham Lincoln's assassin. On this beautiful May day, we each chose a grave to adorn with one red rose. Being a proud Michigander, I found the grave of a member of the Michigan infantry from the Civil War. My oldest daughter also chose a Civil War era soldier, and my wife chose a man who served in two wars. My youngest daughter is too young to choose, so we honored one of the many graves of an unknown soldier on her behalf. A Memorial Day ceremony was in progress when we arrived, so we quietly watched as veterans spoke of the importance of this day. They placed wreaths at a few graves, and a bugler played taps as they lowered the cemetery's flag to half mast. In the distance, visitors respectfully roamed the cemetery, and a couple with a young child placed white flowers on several graves. Soon everyone would go back to their daily lives, but for these few minutes on these hallowed grounds, we were united in the memory of those who sacrificed themselves for our liberty. Alexandria National Cemetery's main entrance is located at 1450 Wilkes Street in Alexandria, and the Jamieson Avenue entrance is directly behind the Residence Inn on Duke Street. 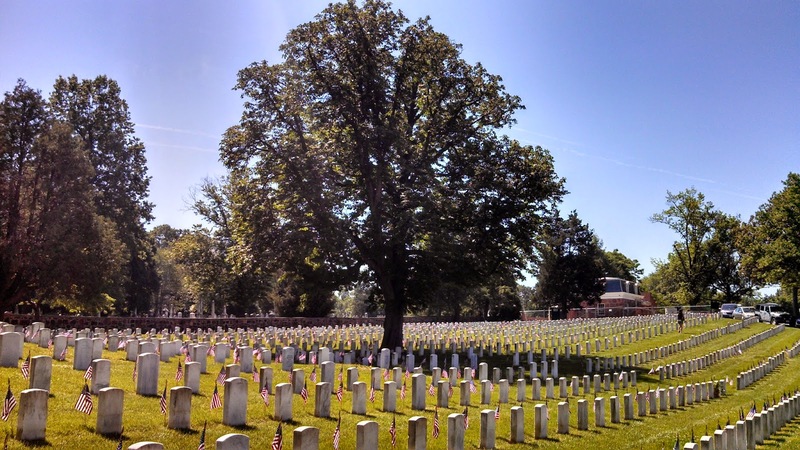 The National Cemetery Administration maintains Alexandria National Cemetery and another 130 cemeteries in 39 states. The cemetery is open daily from sunrise to sunset.